The beginning years of Pan Am were exciting and amazing years that changed the world forever in so many ways. Brothers Mario and Nilo Borges are part of that history. 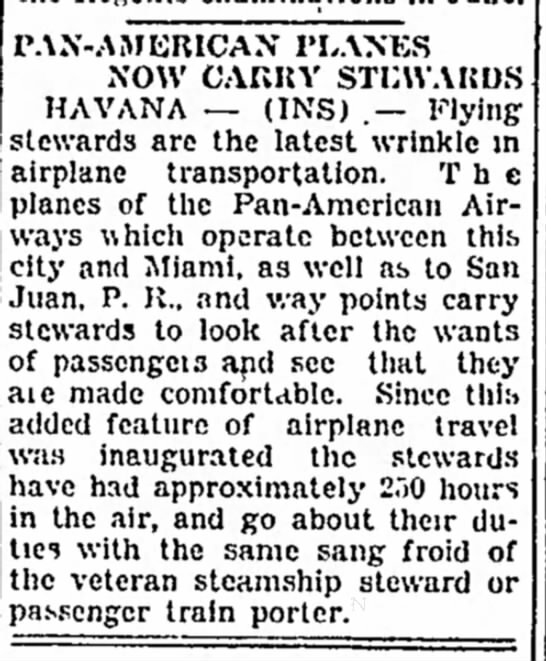 Ten stewards were initially hired by Pan American Airways. Amaury Sanchez was the first and we know from records that Charles Rebozo was also one of the ten. It pleases Clipper Crew to confirm that Mario and Nilo are also included in this elite group. Proficient in more than one language, charming, educated and handsome, the Borges Brothers decided to join Pan American. It was a perfect match. In the late twenties, this was truly an opportunity not to be missed. 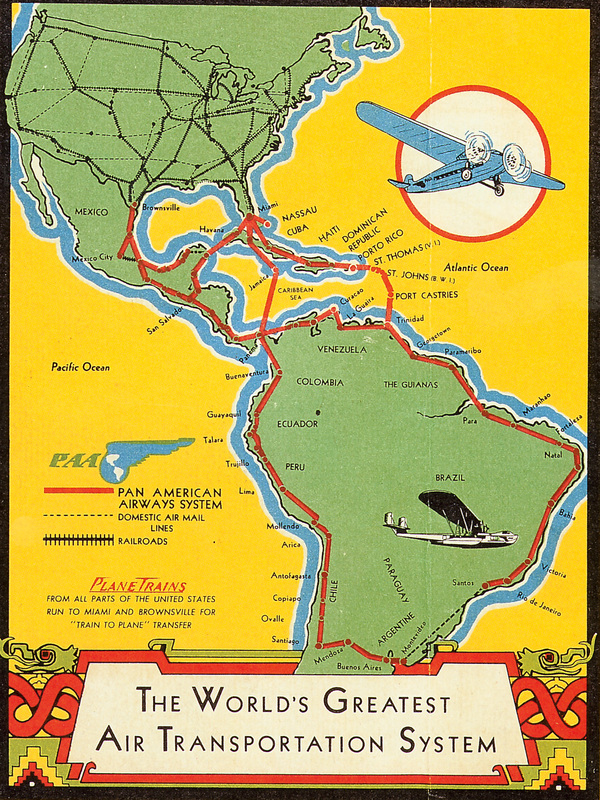 After its inaugural service to Havana, Pan American rapidly expanded to Caribbean and South American routes. As it grew, its fleet increased and the need for cabin crew grew exponentially. What was flying like back then? 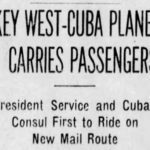 Here are excerpts from an article written by Clara Trenckmann about Pan American’s General Traffic Manager J.M. Eaton and his attention to detail. The Brooklyn Daily Express printed this in 1929; the text literally sweeps us back to a time of magic and adventure. “Five minutes before plane time a steward bows and courteously informs the passenger that his plane is ready and leads him to his chair. He has already been advised that he may erase all baggage worries from his mind. Everything will be in his hotel when he arrives. On the door of the cabin are an altimeter and an airspeed indicator, so that the passenger knows at all times, how high, how fast, how far and how close to schedule he is flying. For the sake of the passenger the trips are divided into two hour hops. In this way, monotony, the inevitable bugbear of continuous traveling is completely sidetracked. Every pilot, mechanic, traffic man, in fact every employee of the company, wears the trim dark blue and white naval uniform, excepting only the stewards, who wear short white linen coats and vests with dark blue trousers. All the men look neat, and extremely well-groomed. A visit to the terminal at Miami is ample proof of the value of introducing design and color into an airways system. The silver roof of the terminal building with its calm, dignified, Spanish architectural lines slopes down over the creamy tan stucco walls. The tiled lobby inside is divided by a wrought iron grill work to separate the incoming from the outgoing passengers. Red leather upholstered chairs are scattered about. The planes are most colorful. In the Fokkers the fuselage is silver, the wings are golden-yellow, the undercarriage and landing gear Holland blue. The entire body of the Fords is silver, the undercarriage and landing gear are Holland blue, and the Sikorsky Amphibians have silver-gray bodies and pure silver wings and blue landing gears. All the planes carry either eight or twelve passengers. Just glance at a sample of headlines from back then. If you wish to read the entire article simply click on the date of each one to read and it will conveniently open in a new tab. When finished just close (X) the tab and you will find yourself back on this page. Mario, the elder of the two, was about 21 years old when he began working. Nilo listed his age as 17 but we have through research established he was much younger, more likely 15 at the time. He wouldn’t be the first to “fudge” his age to be hired by Pan American, certainly it was very enterprising of him. How lucky for Pan Am that he did so. 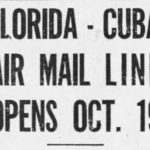 Through conversations with Mario’s son, we learned the brothers were with Pan American Airways from its beginning. 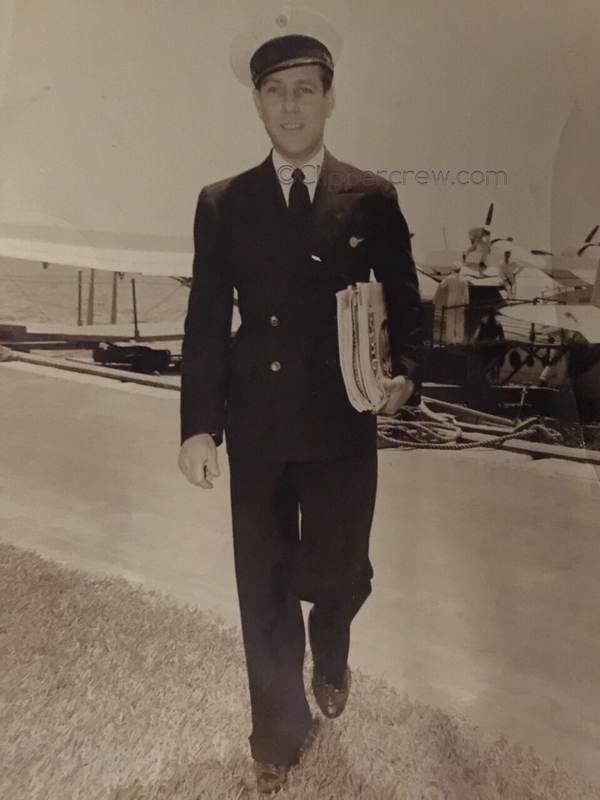 They remained in the aviation industry their entire lives and frequently changed positions from steward to purser to steward, moving also to different airlines later in their flying career, returning to Pan Am or a subsidiary more than once. Perhaps they wanted more time at home, but everyone, including the family, suspects it was for adventure, better pay, and different routes. 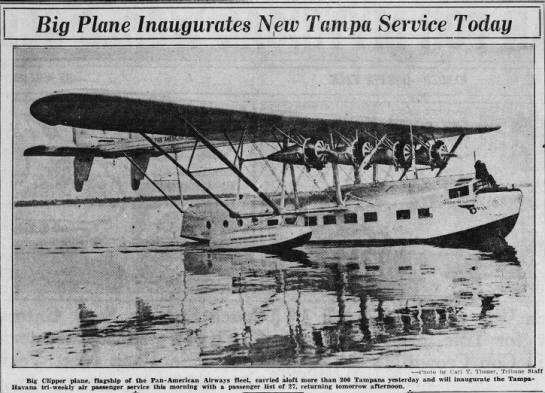 In 1933 Pan American inaugurated travel from Tampa Florida to Havana Cuba. It made headlines. On page two Mario is listed as the steward on that flight. 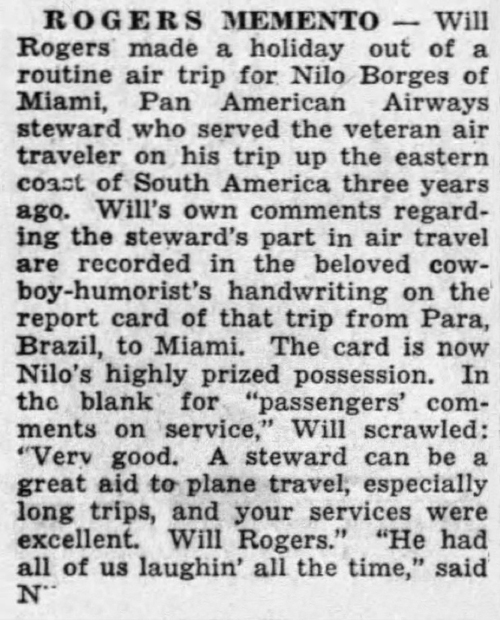 One of Nilo’s fondest memories was being personally remembered by Will Rogers in comments Will Rogers made about his recent air travel reprinted in The Miami News August 28th 1935. 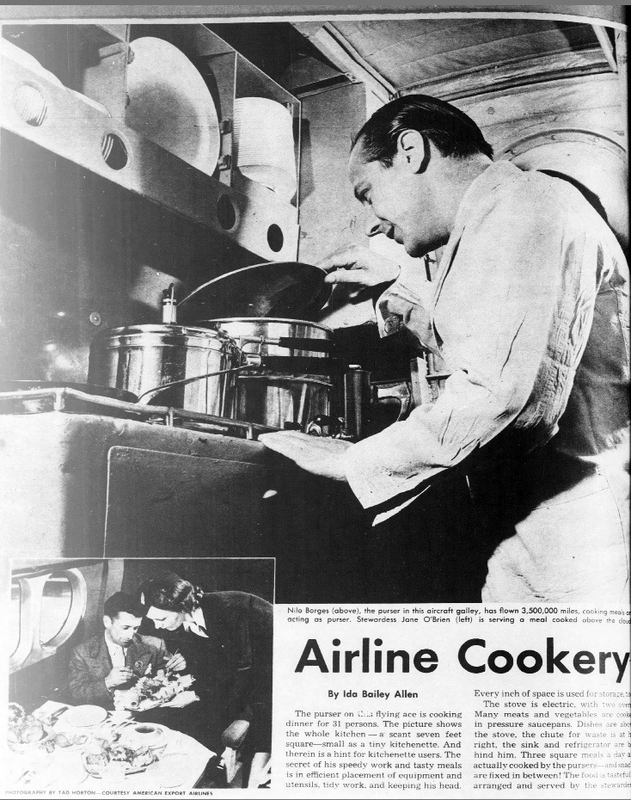 In 1944 a photo of Nilo hard at work in the galley, featured in The Detroit Free Press in an article about airline cookery. Though they never experienced any crashes personally, Mario and Nilo did lose friends and crew mates in at least one crash. 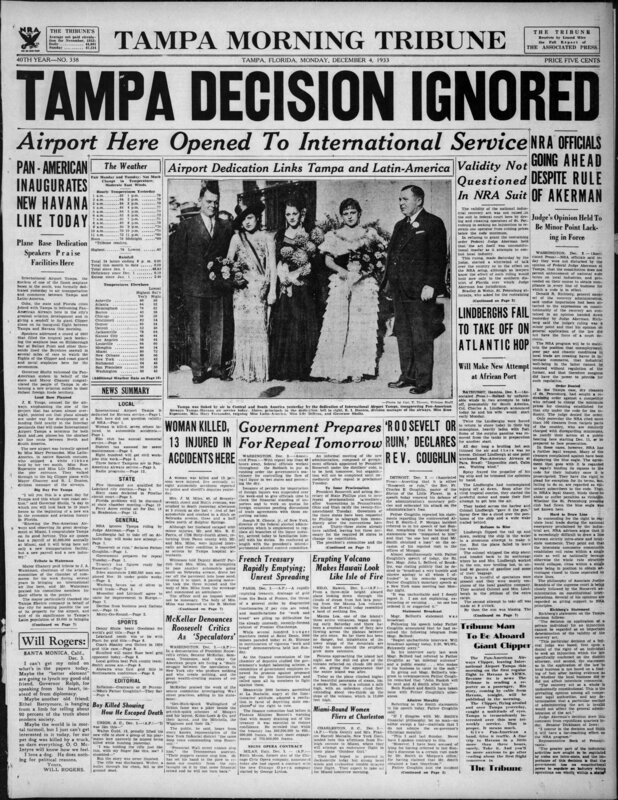 Mario Borges Jr. vividly remembers a day in 1939, when as a young boy he was walking about Miami holding the hand of his father, when all of a sudden the corner newsboy started shouting “EXTRA EXTRA READ ALL ABOUT IT PAN AM PLANE CRASHES.” This of course refers to the crash in 1939 of a Pan Am Sikorsky S-43 as it was circling Rio readying for a landing . Tragically only two passengers survived the crash. Mario Jr. remembers well how upset his father was at the time because the family knew the crew. 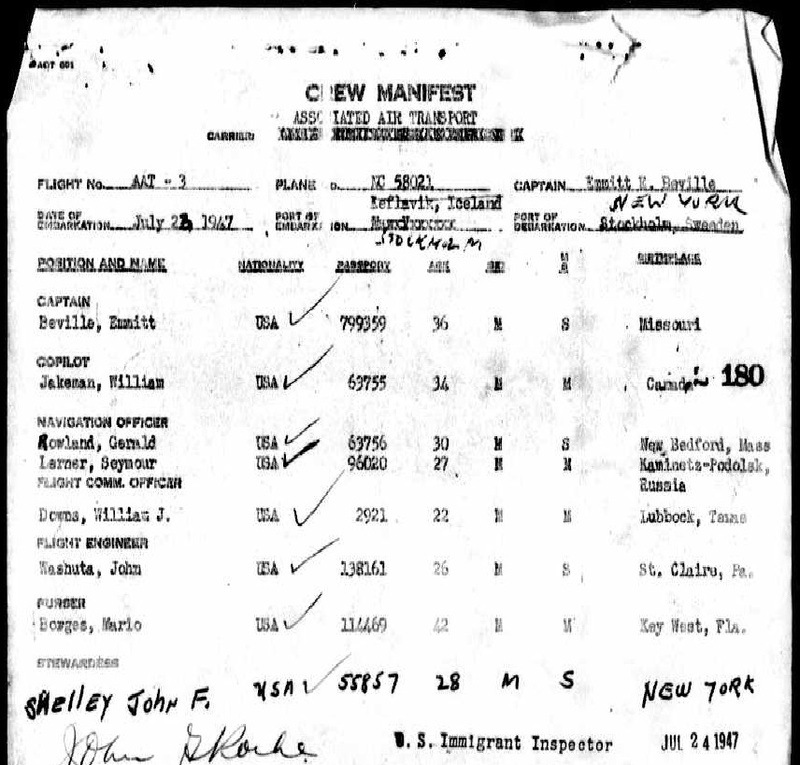 It can be a challenge to determine which airline they were with at a given time because many times in entering the U.S. the same form was used for different airlines and the name of the airline was not always accurate. We do know that both brothers flew to many parts of the world other than Central and South America. 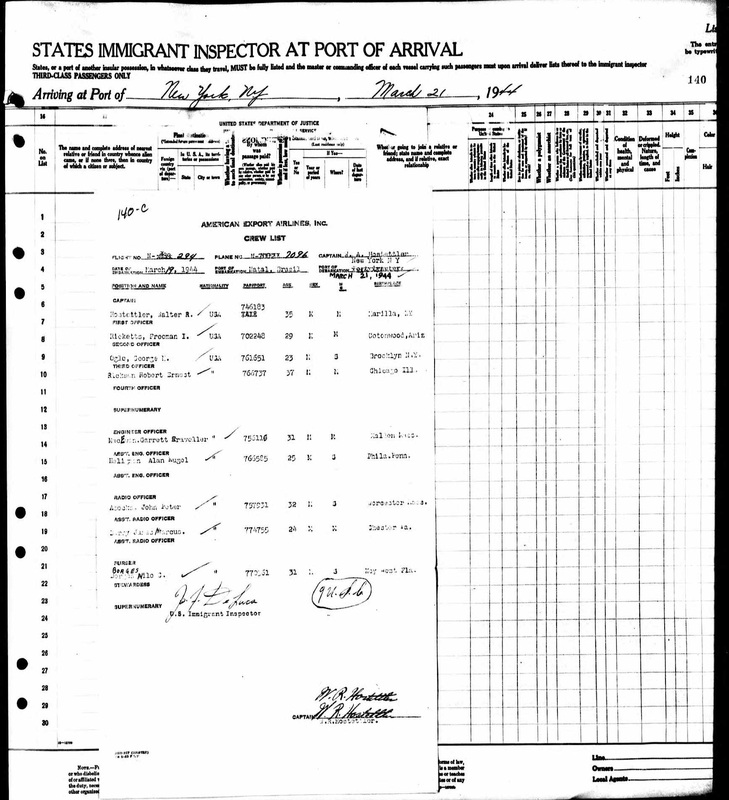 For example Mario flew often to Stockholm Sweden, while his brother in 1943 was flying from La Guardia to Foynes, Ireland. One day when Mario Borges, Jr. was at work as a teller in the Florida National Bank, Juan Trippe came in to transact business. Mr. Trippe noticed Mario Jr.’s name tag and excitedly asked “Are you any relation to the Borges Brothers? They are wonderful fellows.” Mario was so proud and honored to tell Mr. Trippe Mario was his dad and Nilo his uncle. We have however, saved the best for last. 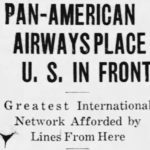 Pan Am had many firsts but the Borges Brothers had a notable one as well! Click to read about The Million Mile Club. Sadly Nilo died in his late 30s in 1950 of cardiac arrest, while at home in between trips for Avianca. Mario died in 1970 at the age of 64. His son shared that most of the Borges men died young of heart attacks; we are so pleased he is the exception to this rule! We salute their memory and their passion for the aviation industry. 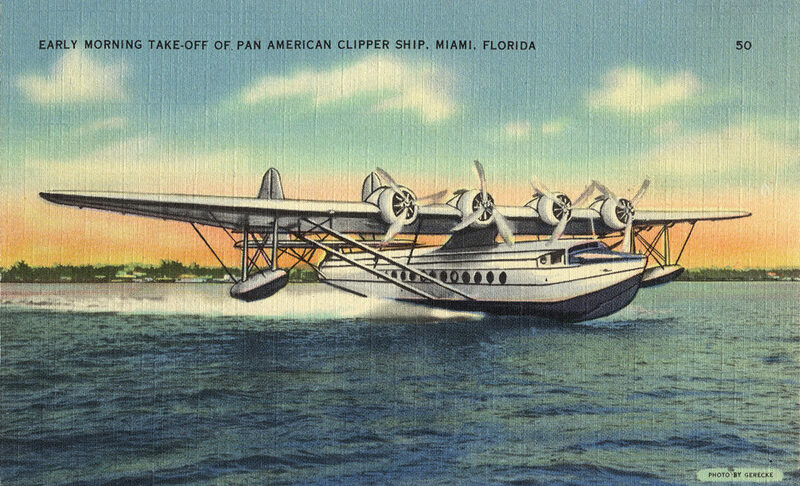 Clipper Crew extends its thanks to Mario’s son, Mario Borges Jr., and Lynn Borges Roberts, Mario and Nilo’s grand niece who first contacted Clipper Crew. It has given us enormous pleasure to add the Borges to our Flight Attendant history pages.